Learn a fast way of authoring your blogs and where you can get high traffic that converts. Save time and effort with rapid blog authoring. SuperFastBusiness members can login here. For access to effective tips and training, register with SuperFastBusiness. Give your feedback on our news tips. James Schramko with the Internet Marketing news update. Be sure to check out my post on internet marketing speed this week about rapid blog authoring. I was able to crank out some blog posts just using my iPhone and Siri. In fact I created the whole post from just talking without having to type anything on the keyboard. It’s pretty cool. The other post that I put was about owning the race course. I’ve seen some internet marketing commentary about Facebook hiding your fresh content unless you pay for it. Well, I’ve got some thoughts on owning the race course. I’m not at all surprised that Facebook are going to do what Facebook want to do. And I certainly don’t think you should winge about it. I think you need to go and understand about ownership and control and the ability to have your own choice. You should be building your own content on your own platform, i.e. a WordPress blog on a domain that you own and then use other places to bring people back to your website. That makes sense to me and if you’ve been following any of my material for the last 5 or 6 years, I’ve said the same thing. Own the race course, not the race horse. Alright, what do you use for simple graphics? When I was using PC about 4 years ago I used to love a program called SnagIt. I think that is great value. Now that I’m on Mac, I don’t use SnagIt; I don’t think that SnagIt version for Mac is very good at all. If I need to make something, I actually use Keynote which is designed for slideshows but it’s got pretty good interface for making fonts and lines and graphics, etc. So that’s what I use and then I take a screenshot. But the best option of all is to hire a designer who is really good at design. I’m not that great at design so I have designers on team and then we make this stuff in house. Like every single blog post from SuperFastBusiness comes with a custom made picture that my designer has made. When you get on an airplane, when you go to a hospital, the people operating these things are using checklists and the same should be for your business. Put a checklist for the things that you do all the time. You can use the reminders tool if you’re using a Mac. You could use Evernote, you could use Basecamp, it doesn’t really matter or you could even put it on a piece of paper and print it out. But have reminders and checklists in place. 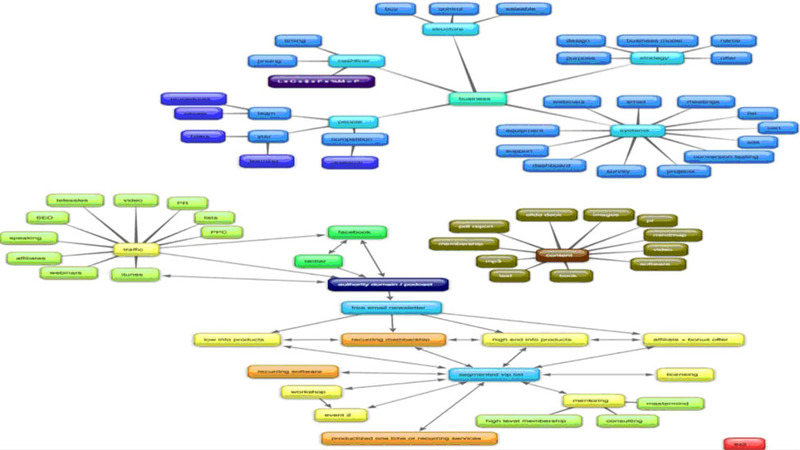 On my spare computer screen, I use a Mind Map from FastWebFormula 3 called the Mafia Plan and I use that to remind myself of the way that I can prepare content, the traffic channels that I can use, how my products and services fit in to my overall business model, and about structure and control and research, etc. This is what it looks like, and you should have your own. Put some sort of checklist where you do your things so that you can actually reduce the time it takes for you to think about stuff and you can systematically go tick, tick, tick, tick, tick and get through the stuff faster with less error. Make sure your team are using checklists. We call them standard operating procedures. Checklists should be modified all the time and they should have the essential things on them that you can give to somebody else and they can just take over the job and they can do the job without any extra input from you. There were some discussions about 200% affiliate commissions in SuperFastBusiness this week. It’s where you pay a big commission upfront to acquire new customer. It will work as long as you know your lifetime value of a customer and of course you can’t really pay backend commissions if you’re going to take that approach. What I prefer to do is to pay a good commission upfront but to continue paying commission on upsells and cross sells and backend sales so that my affiliates get paid for long time across different products in my shopping cart. That way they’re really happy and they’re continually reminded about sending customers to me and I’m happy too because I’m adding new customers to my business. Affiliate marketing when you’re the business owner is just a marketing cost so be sure that your percentages are appropriate compared to what else you could spend your money on as the business owner in terms of straight marketing, getting your own customers. How do you accurately check emails? What you should do is you should set a trackable links that tie up with your analytics and also if you’re using services like AWeber or Office Autopilot, a lot of them will have the ability to either split test, broadcast sequences or you can also use the reporting facilities to show where your customers unsubscribe in a series of emails and you want to go back in and then modify those emails where people drop off. Now in AWeber that’s quite easy going to the reporting features. In Office Autopilot they allow you to have A, B, C, D split test on sequential follow ups. You can actually let people take a different path and find out which one is getting you the best results. Be sure to use a trackable link so that you can actually see which links they’re clicking on and where they drop out of your sequence and of course which ones turn into the bigger buyers. You can do that with modern auto responder software systems. There’s a discussion in SuperFastBusiness about high converting traffic. Incidentally email lists is the highest converting traffic that I have and probably with you. So on your site; make sure you put an email capture. Make sure when you sell something, that you capture the customer’s details because this will be your number 1 traffic source, number 2 traffic source a forum signature. Forums are where people go where they have a common interest and they’re a strong community and you can earn credit and you can earn trust by continually posting good solutions. Many forums including SuperFastBusiness, allow you to carry a signature at the bottom of each post that you make while you’re an active member. In that signature you can put a call to action that takes people to something that you sell or a newsletter where you can continue to deliver value like I do from SuperFastBusiness. So your own email followed by your own signatures and then another great source of traffic that converts really well is Podcasts. People haven’t really gone on to podcast bandwagon yet but you should be. Whenever I poll or survey my customers and I say where did you first find out about me? It’s usually a podcast. So I’m doing interviews every week, I’m publishing 3 podcasts of my own and I encourage you, get into the podcast scene. There’s a whole tutorial about podcasts inside SuperFastBusiness. Watch it and discover how you can get one of my top 3 traffic conversion sources happening for your business. I hope you’ve enjoyed the internet marketing update this week, I’ll catch up with you next week.